A free standing skylight fall protection system which does not penetrate the roof membrane. 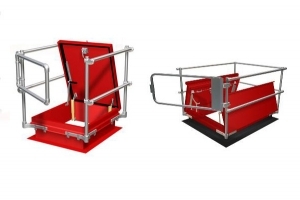 A safety railing system designed for safe egress/ingress through roof access hatches, and protection while the hatch open. KeeHatch meets and/or exceeds current safety requirements and standards. Learn more about this product. Skylight Fall Protection Screens for curb style, standing seam, and rib/corrugated metal roof skylights. 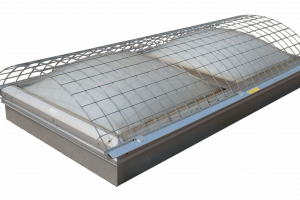 A collective, free-standing, fall-protection solution for use around skylights, rooflights and domelights up to 2m x 2m in size. 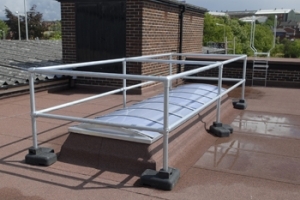 The modular system allows contractors and maintenance crews to access rooftops for repair and maintenance work safely and easily without the risk of falling through glazed areas. Learn more about this cutting edge product.